More than two years after the Consumer Financial Protection Bureau found that reverse mortgage ads create a false impression of the financial product, the agency is once again warning older consumers about the dangers of using reverse mortgages. This time, the CFPB is warning against using reverse mortgages to provide income that would allow the individual to delay Social Security benefits, which can increase their future monthly benefits, but decrease their overall, long-term financial outlook. The CFPB today released a report highlighting how the risks of taking out a reverse mortgage exceed the benefits one might expect from delaying their Social Security lifetime benefit claims. Reverse mortgages allow a borrower, 62 years or older, to convert the equity on their home into either a lump sum or monthly payments. The funds are not required to be paid back until the borrower moves or dies, however, they come with fees and incurred interest. According to the agency, financial professionals are increasingly promoting the use of a reverse mortgage loan as a way to delay claiming Social Security benefits. Through this approach, a homeowner uses a reverse mortgage loan to replace the income they would otherwise have received by claiming Social Security benefits at an early age. Individuals can begin to draw these benefits at the age of 62. However, if they delay taking the benefits until a later age, their monthly Social Security benefit increases, as does their cumulative lifetime benefit. For example, a woman age 62 today who lives to age 85 will receive $29,640 more in cumulative benefits during her lifetime if she claims a monthly benefit of $1,300 at age 67 than if she claims a monthly benefit of $910 at age 62. According to the CFPB’s report, while increasing your benefits later in life might seem like a good idea, doing so by taking out a reverse mortgage likely isn’t the best option. For instance, the agency found that the average reverse mortgage costs can exceed the lifetime benefit of waiting to claim Social Security. The average length of a reverse mortgage for borrowers at the age of 62 is seven years. By the age of 69, the average borrow will pay approximately 60% in costs, when considering interest, insurance, and fees. To this end, the CFPB calculates that by age 69, a borrower who takes out a reverse mortgage will pay $2,300 more than the cumulative lifetime amount the typical borrower will expect to gain from delaying their Social Security. 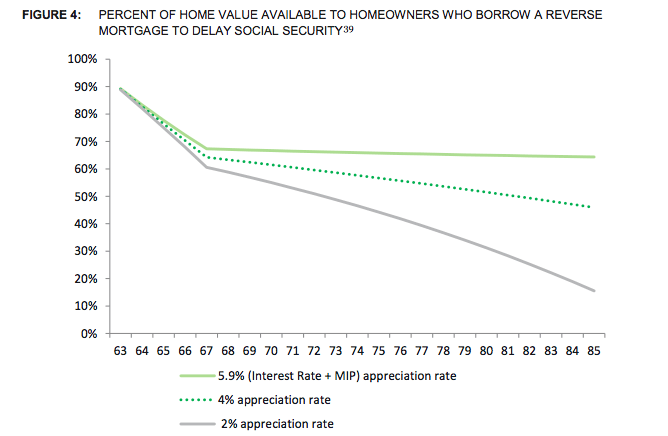 In addition to not actually gaining benefits, a reverse mortgage borrower can expect to see a reduction in home equity. The CFPB cautions that reverse mortgage borrowers who plan to sell their homes are at risk, as their loan balance is likely to grow faster than their home value will appreciate. For example, if a 62-year-old homeowner who has a home worth $175,000 with an appreciation value at a rate of 4% takes out a reverse mortgage with a 5.9% interest rate the equity in their home will decrease. In five years, when the homeowner is 67, the home’s value will be around $212,914, but their equity will only be about 64% of the home’s value, according to the CFPB. This value decreases even more over time; at the age of 85, the homeowner will only have 46% equity in the home. The CFPB concludes that there are other options for those looking to delay or build up their Social Security benefits, including working past the age of 62. The extra years of work often provide people more time to save for retirement and pay off debts, the CFPB notes, adding that it also can result in an increase in Social Security benefits — separate from the increase that arises from deferring the start of benefits — by replacing years with low or no earnings from the person’s earnings record. Older consumers could also consider coordinating their claiming decision with their spouses to increase their Social Security benefits. In an effort to better inform homeowners of the potential risks of taking out a reverse mortgage, the CFPB created a handy consumer guide [PDF] and and video. The guide and video cover issues to consider before applying for a reverse mortgage, such as how much a homeowner can borrow and how the loans work; the possibility of losing the home by failing to meet loan requirements; and what happens to the home after the borrower no longer lives there.